Magic Paradise,If you like being in the center of the action and just seconds walk to everything you could possibly experience in Playa del Carmen, then Magic Paradise is your home away from home. There is a community pool and all homes feature marble flooring and Air Conditioning. 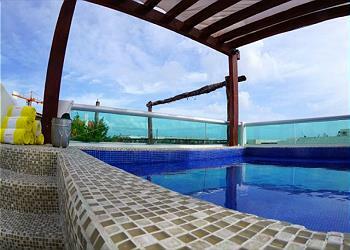 Great Penthouse units available here with private roof top terrace and private pool. Location: 28th street located between World Famous 5th Avenue and the Caribbean Ocean Just one block from Mamitas Beach and Kool Beach Clubs. Ideally situated only a 2 minute walk from the crystalline waters of the Caribbean Sea and “Mamitas Beach Club’, Magic Paradise offers a whimsical setting with its charming Mexican architecture and pristine pool enveloped by a lush, tropical garden.